This is Not Just Vegetarian‘s 100th post! Thank you, dear readers of this blog, for your comments and for inspiring me to continue writing this blog!! For this post, I was debating in my mind if this should be a post about NYC (where the blog started) or about London (where most of the Not Just Vegetarian blogging happens these days) and I ended up somewhere in the middle – a post about a New Yorker eating NY Italian style Pizza (in a wood-fired oven) in London at Goat in Chelsea, London. Goat has preserved some of the original features of “Goat in Boots”, a (350-year-old) pub that occupied the building prior to Goat and some aspects of the “333 Club” to create a restaurant on the ground floor and an all-day cocktail club on the top floor. 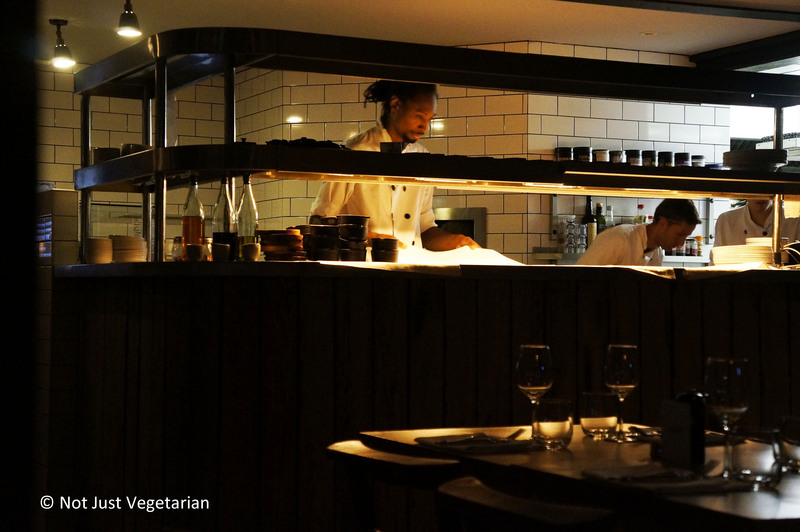 Each of the dishes we ordered was prepared with a lot of care and tasted delicious. Given the location of the cocktail club right above the restaurant, we felt that we must not expect much from the food, but were pleasantly surprised with every dish that we ate – our expectations were far exceeded. 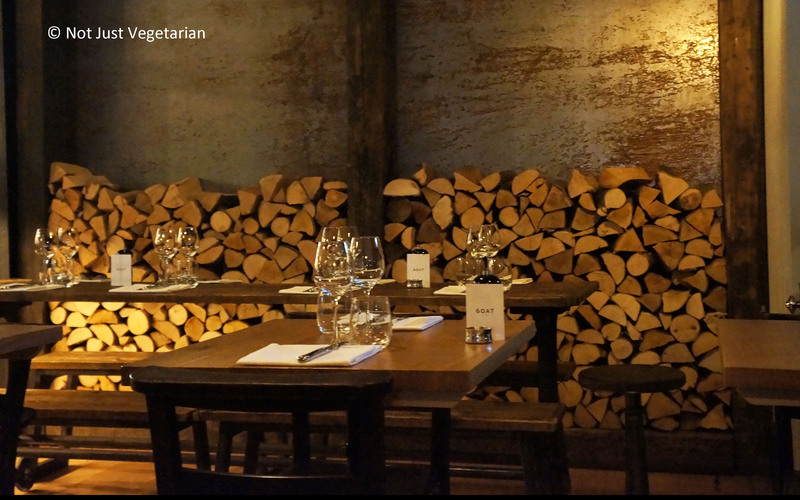 As with most Italian restaurants, there was a good range of vegetarian options among the sides and appetizers. We got a side of broccoli and the fried calamari as appetizers, a pizza with pesto sauce, and bresaola, and the chocolate and caramel foam for dessert. All dishes are highly recommended. 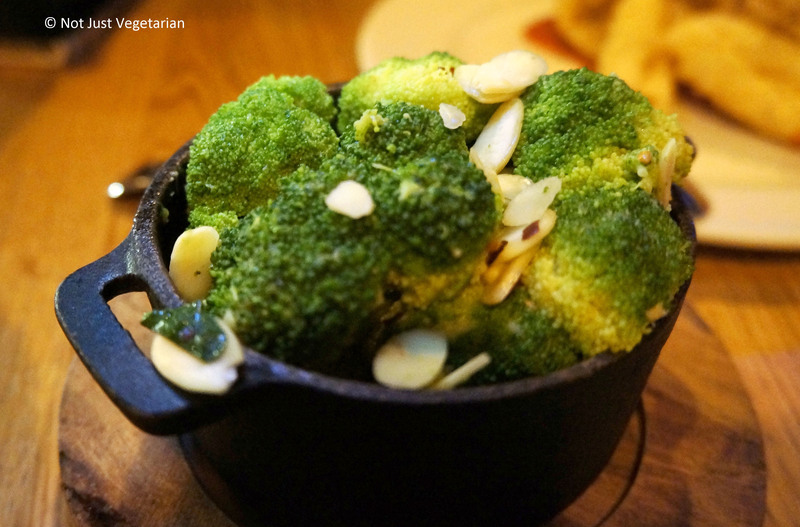 The side of broccoli was made with garlic, chilies and sliced almonds – perfect in taste and texture! 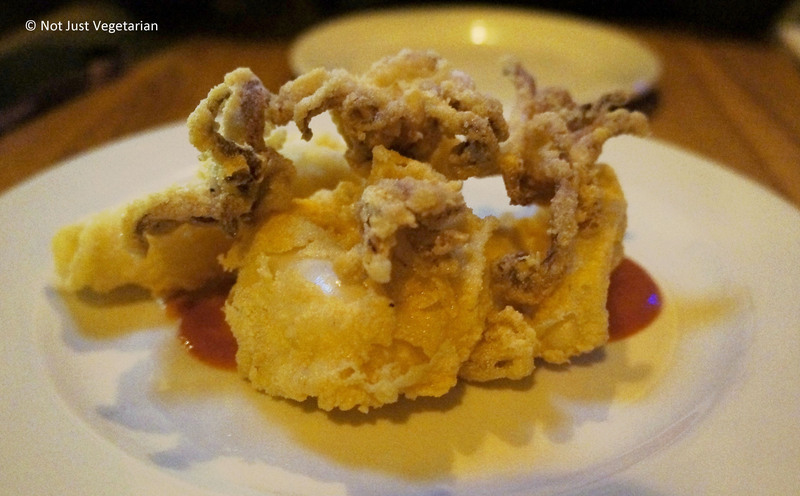 The fried calamari was delicious and crispy! I could not tell that the tomato sauce was made from sun-dried tomatoes and could certainly not see or taste the olives, but the calamari itself was simply too good to miss. The thin-crust pizza was crisp through out and charred nicely. The pesto was mild and spread thin ensuring that it did not make the pizza soggy. One can never go wrong with truffle oil on anything, right? 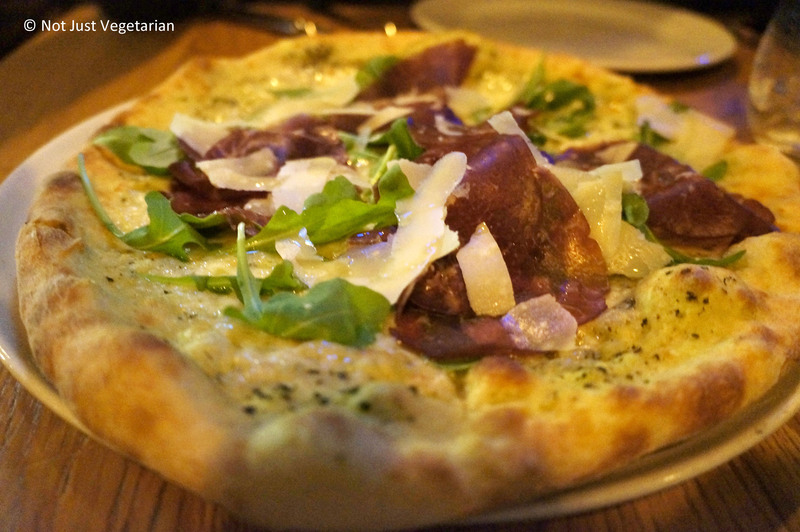 Must get this bresaola pizza again! We were intrigued by the chocolate and caramel foam dessert and ordered it. 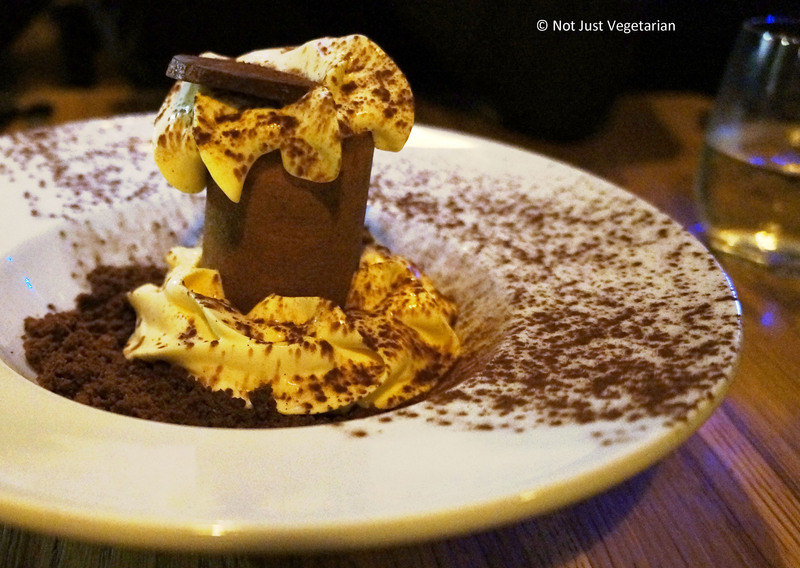 One of my favorite desserts since moving to London – I was not sure where the caramel was, but the gritty powdered chocolate at the bottom of the thin chocolate cylinder contrasted well the cream and smooth chocolate (or was it the caramel?) filling in the cylinder in both in taste and texture. If you ever go to Goat, I recommend getting this dessert even though I did not try any of the other desserts. I would go back to Goat in Chelsea again, not just because it has a nice charred NY Italian style pizza made in a wood fired oven, or because the tap water felt like water at a spa (see the thin slice of cucumber in the water jar), but because all dishes were simply too delicious to miss. Now, I have to check out the cocktail bar that is open late every night and the weekend brunch. Readers from London, please tell me where else in London can one eat NY Italian style pizza?